As the UN’s COP 20 global climate conference gets underway in Peru, the focus is on governments’ emissions reduction pledges. Already on the table: a much-welcomed US-China pledge to cut their greenhouse gas emissions by 2030, and China’s commitment that CO2 emissions will peak the same year, and 20% of its primary energy consumption will come from non-fossil fuels. In the seven or so years since China became the world’s largest greenhouse gas emitter, the Chinese government has ramped up investment in low carbon energy and evolved a growing array of climate and energy policies. For example, by setting low carbon energy targets for non-fossil fuels to generate 11.4% of total primary energy by 2015 and 15% by 2020. However, China’s rising demand means new fossil fuel capacity is added continuously: the overall share of renewables within total energy supply is stagnating at best, despite impressive investments in low carbon energy technology and a wide array of climate and energy policies. In fact, China is investing more than any other country in the world in renewable energy, including hydropower, wind energy and solar energy. China’s approach has mainly focused on large-scale technologies and interventions, such as solar photovoltaic (PV) and Concentrated Solar Power (CSP). However, a small-scale technology has made a significant contribution that goes largely unnoticed. Domestic solar water heaters are ubiquitous and massively successful in China: they are the rarely-mentioned champion of low carbon energy policies there. Solar water heaters are used by over 30 million households, and are particularly popular in rural areas. Even so, that still amounts to less than 10% of China’s estimated 365 million households. Solar water heaters are still far from mainstream. There is huge potential and in an as-yet under-exploited market. China’s approach to driving forward low carbon energy technology and innovation has has traditionally taken a top-down, centralised route, in which national government sets the goals, while provincial implementation sometimes lacks behind. China is thought to have 134 GW of solar thermal heating capacity currently installed, about 65% of world capacity; the 12th Five Year Plan’s ambitions for solar power generation in 2011-15 are built around reducing the price of solar power and increasing output of PV modules. China’s approach to emission reductions and low carbon energy has focussed less on smaller-scale, bottom-up approaches. However, Chinese firms manufacture around one million solar water heaters a year, mainly for the domestic market. In the 1990s, Chinese scientists developed the evacuated tube design as a low-cost, indigenous innovation. Chinese firms are thought to hold 95% of all patents worldwide for solar water heating core technology; roughly 3,000 solar water heater firms operate in China, many of them small and medium enterprises. It is an industry that has seen a decade of rapid growth that looks set to continue. Yet, the success story of solar water heaters is seldom told. Millions of Chinese customers value solar water heaters as they offer good quality, high performance cheaply. At the same time, they are environmentally-friendly, reduce pressure during peak load and thereby contribute to energy security, and create opportunities for economic growth and jobs, typically in smaller towns and cities. There is one drawback: though solar water heaters are a common sight in rural areas, they are not considered trendy in urban areas. City dwellers consider them as “rural”, and not made for the urban middle-classes. Solar water heaters have received relatively little stable national financing incentives in the years since 1998, when the evacuated tube design was commercialised. There are few national level formal subsidies and very limited supportive industrial policies for manufacturers. Policy support is more apparent at local level. Nonetheless, installations and sales have increased rapidly in recent years, particularly in rural areas and smaller towns. Meanwhile, China’s central government and its policies continue to focus on large-scale, still-expensive solar installations, fostering large-scale PV projects and CSP plants. The success story of solar water heaters seems detached from the central government approach, following its own localised, bottom-up, decentralised dynamics, fuelled by the demand of tens of millions of households for cheap water heating devices all over China. However, this humble technology is cutting CO2 emissions and contributes to lifting the share of non-fossil fuels in primary energy consumption, thereby feeding into China’s newly announced climate and energy targets. Nevertheless this technology and these dynamics are not formally addressed in key policy documents. Solar water heaters are a sign that Chinese citizens may be ready for actively pursuing a low carbon transition by making solar their first energy choice. 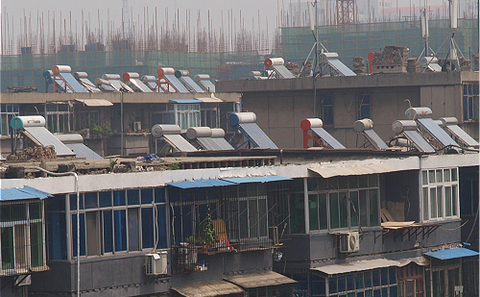 Bringing solar water heaters back into China’s energy and climate policies, helping to popularise them in urban areas, and including them in official targets could bridge the gap between the large-scale, top-down renewable energy policies relevant to the UNFCCC negotiations and its small-scale, bottom-up, citizen-led approach to solar water heaters. As COP 20 gets into full swing, the success story of solar water heaters is unlikely to get much attention. However, more than 30 million households have made their energy and climate choice already by turning towards them. Small is beauty. The high quality produced by China, like the small-scale wind turbines, solar water heater, solar reading lights and rooftop solar generator suit developing countries well. India could apply these. Dr Frauke Urban is a Senior Lecturer in Environment and Development at the Centre for Development, Environment and Policy (CeDEP) at the School of Oriental and African Studies SOAS in London.